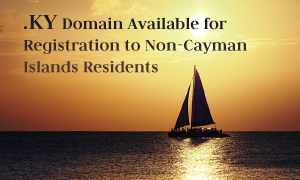 As of September 2015, the Cayman country code domain has been made available for global registration. Anyone in the world can now register a .KY domain name without restrictions on a first come, first served basis. In the past, domain names under the .KY extension were available only to Cayman residents. However, the Cayman Domain Authority have opened it to international community much like Montenegro’s .ME or Colombian .CO domains. Due to their attractiveness and flexibility of use, those national domains are often used as generic domains and are referred to as Generic country code Top Level Domains (GccTLDs). The global launch of the .KY domain was announced in March 2015, giving local residents and businesses an exclusive six-month period to confirm whether or not they wished to keep their previously registered domain names. The .KY domain names that were not renewed or confirmed before September were to be removed from the Registry. If you wish to take advantage of the newly available domain, register your chosen .KY domain name now, before it is taken. If you need assistance or have any questions, please do not hesitate to contact us at support@web-solutions.eu.